At times like this we wish we'd paid more attention in our physics classes. Because then we'd know whether this video shot from inside a guitar was genuine, fake, or just a curious product of technology. As it is, all we can say for sure is that it's awesome. The video starts with a guitarist taking his iPhone 4 and sliding it into his guitar, before positioning it so that the camera is angled to look out towards the strings. Already this is another idea we wish we'd had (much like this firework cam) but it's when he starts plucking and strumming away our minds were blown -- because the strings appear to move in a very weird way. 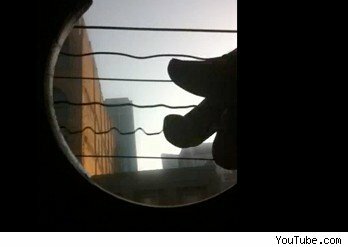 Each string wobbles like a sound wave when strummed, and with each one moving at different speeds it creates an almost hypnotic effect in the video which the uploader 'justkylevids' has labeled "Guitar Oscillations Captured with iPhone 4". But this title caused much uproar on YouTube, because the freaky effect is obviously not the normal movement of the stings and many people claimed the video was a post-production fake. However -- and here's the science bit -- the general consensus is now that the wavy line stings are caused by the rolling shutter of the iPhone camera (it scans across the frame rather than taking a series of snapshots) creating a stroboscopic effect. Because the video is being captured at a slightly different rate from the sting vibration, it produced the awesome wiggling look. But it's not just guitars, similar freakiness can be seen when filming things like propellers too, which you can check out here.